Multi Active Rescue is a security and research organization in Academy City tasked with heavy duty crisis management. If the situation calls for training and equipment that Anti-Skill or Judgment lack, it is up to the MAR divisions to answer the call. Like Anti-Skill, the group is made up of adults. The primary tasks of MAR include civilian management during crisis situations, rescue operations, and casualty management. 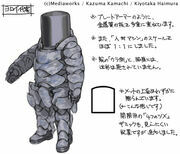 Due to the availability of heavy powered suits to MAR, they are also called upon in situation where Anti-Skill and Judgment cannot provide the necessary firepower. Although MAR is more than capable of working by itself, it is sometimes required to cooperate and work alongside Anti-Skill or even Judgment in certain situations. MAR also has a research division; research topics include AIM Fields and Extra Sensory Perception, but may possibly also include power armor research and engineering. The organization is equipped with its own research laboratory, the Multi Active Rescue Base Research Laboratory. The supreme commander of MAR operations is the Captain, while the research division is commanded by the Head of Research. During normal operations, MAR units are put into groups, with each group assigned a leader; however, in certain situations it may be necessary for MAR units to cooperate with Anti Skill and Judgment forces, which it is easily capable of doing. MAR is especially heavily equipped for a security and high risk rescue organization. It is most well known for its Large Weapon powered armor units. The HsPS-15 "Large Weapon" is the latest model of power armor available to Academy City. It not only provides unparalleled protection to infantry forces but also augments the wearer's strength and endurance. The suits designed to be used either as worn armor or AI operated units. They can also be worn over the standard [[[Anti-Skill]] riot gear to give an additional layer of protection. MAR also has at its disposal a number of more mundane vehicles, including trucks for heavy duty transport, ambulances for medical emergencies, and helicopters for search and rescue operations. The helicopters are sufficiently armed for serving as emergency gunships against lighter targets. Other MAR equipment include standard military rifles and grenade launchers.